With all of the overwhelming advice regarding pregnancy and babies out there, the resources are limitless. If Mister and I are anything, it is information gathers. We like to know all of the possible information and details there are to offer. This is good and bad for parents to be. I will admit I have scaled back my Googling lately (not that it doesn't still happen...) but it's quickly easy to see that there's no way to know or read alllll of the things. To combat that, I've turned to friends and blogs I love that have read books and articles that have really helped them. Currently I am pacing about 1 pregnancy book a month paired with a fun book and a book tape in the car. 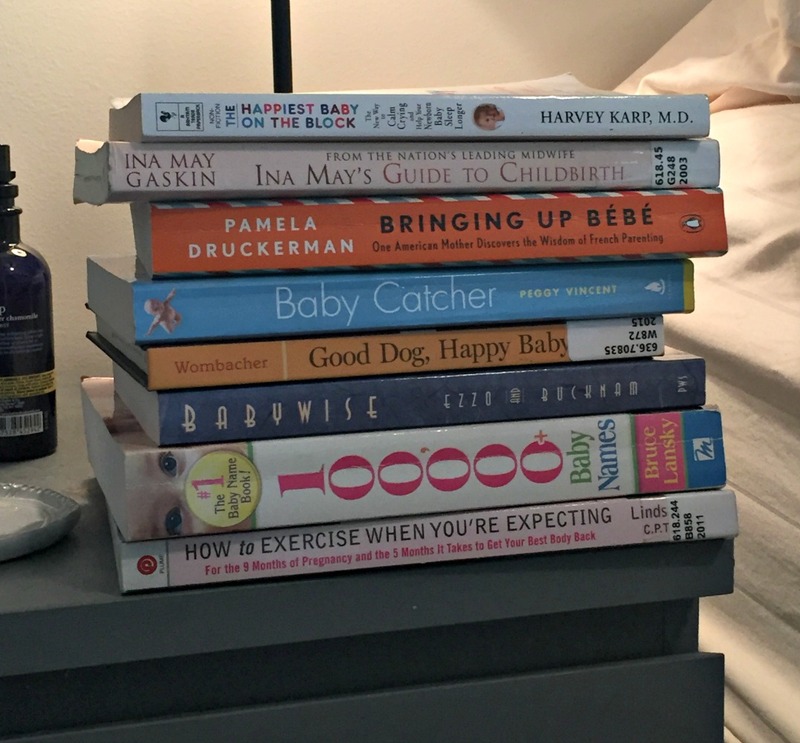 I am trying to be very conscientious of swapping back and forth between pregnancy and non pregnancy readings. Before we were expecting a couple of my best friends suggested I read Bringing up Bebe. They loved the book and how it explains parenting. Once we found out we were expecting, I immediately ordered it. I really, really enjoyed this book. The author does a fantastic job of explaining how the French parent and the slower, calmer approach they take to parenting. The methods and suggestions in this book really resonated with me. I will most likely re-read/skim this book closer to my due date. Baby Catcher was another book suggested to me. While we are in no ways planning on a home birth, this book was incredibly interesting to read. I love reading labor stories and this book was full of them. The book follows Peggy, a midwife, through her career and the deliveries and families she encounters. It is incredible to me to read over and over again how each and every single birth story is different. It really hammers home the idea that women birth babies every single day and that it does not have to be a scary experience but a beautiful one. I saw Expecting Better on a website of pregnancy books to read and I am glad I did. The tag line on this book reads 'Conventional pregnancy wisdom is wrong and what you really need to know'. That spoke to me immediately. With all the information out there it is hard to decipher what is wrong/right good/bad but this book does a good job of breaking down a lot of information. It does get a little deep into research and details for me but the overall theories and knowledge are really great. Happiest Baby on the Block also came highly recommended. I will say the first few chapters of this book are a bit fear mongering but the underlying information is good. The book focuses a lot of the 'fourth trimester' and how newborns are trying to adjust to life outside of the womb at all times and how to compensate and deal with those growing pains. The biggest take away would be the 5 S's holds which I will definitely be going back to for a refresher for when we need some suggestions on getting our little guy to sleep. Belly Laughs was loaned to me from a friend and it was a quick, great read. It was so funny and I often found myself laughing and nodding along with just about everything Jenny was saying. Anne raved about Waiting for Birdy and she was totally correct. Even though the story focuses on a family adjusting to life welcoming their second child it was still a great read for moms. I enjoyed how the author talked about how her parenting approach differed between the first and second child. Regardless of how many children she has, it was nice to read a memoir from a mom going through pregnancy. There are so many funny, strange, amazing things that happen during this time and it is nice to read and reflect that you aren't the only one on the journey. Up next on my docket is Operating Instructions and Babywise. Any other ones I should add to my list?? This will be a great bookmarked post for some momma-to-be's! Great job on all the reading. I'm sure its overwhelming how much information is out there, but it sounds like you're as prepared as you can be! Yay - so excited for you! My fav is "Do Chocolate Lovers Have Sweeter Babies". I loved it! This alternating sounds like a good plan... good to be informed but not stressed out. I admit I've read barely any parenting books, only the ones that are kind of narrative-like - Waiting for Birdy of course was excellent, and Operating Instructions too (and don't even get me started on how much I loved Bringing Up Bebe). I just read the follow-up to Bringing Up Birdy, actually, and it's so great too, but a good one to save for when the kiddo is a little older and you have a little different perspective, because it's about when her kids are toddler stage and beyond. And ohhhh, Ina May. It's a good book, but some of the birth stories completely freaked me out (and I was planning a natural delivery! ), so just don't let yourself get overwhelmed. But definitely good info for delivery and nursing. Reading blogger birth stories was really inspiring at times too, even if sometimes still a little freaky.